We plan to unveil a statue of Nelson Mandela outside our renovated embassy in September. 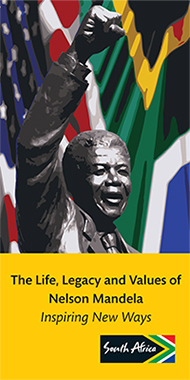 Just as many, from all walks of life, played a role in securing his release to lead the building of a new South Africa, so we would like many to be able to say they had a part in honoring him with this new Washington landmark. In that spirit, we are inviting donations to raise the balance of funding still needed to complete the project. The 9-foot high work, capturing Madiba as he strode triumphantly into freedom in February 1990, will stand on ground where thousands of Americans had themselves arrested in the 80’s to demand an end to apartheid and help win his release. The statue, a model of which is pictured to the right, is the twin of one that stands at the gate Mandela’s last place of confinement, Victor Verster prison near Cape Town. It has been cast in South Africa and is awaiting shipment to the US. For other options and more information, please contact Johnny Moloto, Deputy Chief of Mission at the South African Embassy: Tel. (202) 745 6613; Cell. (202) 368 5933; e-mail: molotoj@dirco.gov.